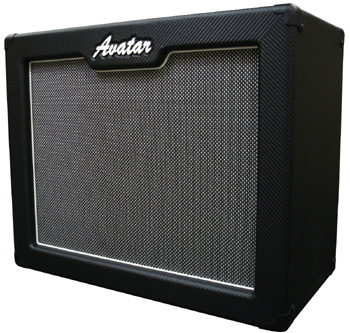 This is our new Avatar Signature 112 guitar speaker cabinet. We took our 112 Contemporary and redesigned the face board. It is now a sleeker front frame, featuring a roundover on the inside edge. It features our newer two-tone logo also used on our amp heads. Countersunk logo and input are also new improvements. It has the stylish thick edge look to it with piping around the grill. The construction is all voidless Birch Plywood and it comes in a variety of piping colors and grill cloth choices. With the oval open back panel, you get plenty of mids coming off of the back of the cone and radiating out into the room. You can also get the closed back conversion board to close up the open back from the inside. It is an additional $15 dollars. The 12 is rear loaded with T Nuts which makes it easy to swap out speakers for tone experimenting. We have many choices of quality Celestion guitar speakers to fit your precise tone preferences. Please go to Celestion.com to read about or to listen to sound samples to help you decide which are best for your playing style and TONE requirements. It has been our experience that some of the favorite speakers for this cabinet are the Industry Standard Celestion Vintage 30 at 60 watts for all around great tone. The 30 watt G12H30 70th Year Anniversary special is also a favorite because it has a big rich warm low end, smooth mids with just a hint of grit when slightly overdriven and nice top end. For the lower powered high end boutique tube amps, the Celestion Alnico BLUE has the most wonderful chime and creamy midrange in a 15 watt cab. A lot of guys that have small boutique amps really like the Celestion Blue or the G12H30. With larger amps, the 50 watt Celestion Alnico Gold would be the ultimate speaker for this cab. It is voiced similarly to the 15 watt Alnico Blue with wonderful creamy chime tone but has a higher power capacity. The Signature cab dimensions are 22″W x 18″H x 12″D. Weight is approximately 45 lbs depending on speakers. Speaker cabs are not sold on a trial basis and are not returnable. You get a One year limited warranty. The cab does come with four rubber feet on the bottom but they have just been cropped out of the photos.